Mobile technology is now being used for everything from paying bus fares to eye tests, donating money for disaster relief to distance learning. ICT for development remains a big issue in Africa and here’s a sweep of some of the latest developments that we’ve been following at Indigo. Governments in East Africa are pressing ahead with their ambitious e-learning plans for schools. Uhuru Kenyatta’s election promise of providing all pupils starting school in 2014 with a free laptop has been met with mixed reactions and mixed results. If plans are successful, the next generation of Kenyans will be equipped with unparalleled IT skills. Teachers, however, are split on the project. Some have embraced it as a welcome attempt to improve standards of education, part of the country’s Vision 2030 goals, while others cite the raft of more immediate problems in the school system. An interesting and comprehensive analysis of the system’s problems can be found here. While the education secretary insisted this week that the project was on track, reports are rife of a coming crisis. The lowest cost tender has come in at triple the proposed budget, potentially putting the whole project in jeopardy. The progress of this model is being carefully followed in the rest of the region. Tanzania has recently announced the digitisation of all of its educational materials with plans to teach through laptops, smartphones and tablets in the future. This strategy is one that has a lot of potential; indeed Indigo has given a grant to Kytabu to build a beta platform for textbook subscription on tablets in neighbouring Kenya. Beyond East Africa, e-learning is being used in Africa for everything from distance learning university courses written in local languages in Nigeria to professional development courses for teachers. An excellent piece on e-learning in Africa from the Times Higher Education Supplement can be found here. In recent months, a host of exciting new apps designed to improve health have been launched in Africa. With entry-level smartphones now available to buy in sub-Saharan Africa at lower prices than ever before, apps provide an incredible opportunity to distribute software tools to improve the lives of people across the region. One such app is Peek, which allows non-experts to gather detailed clinical data on the condition of patients’ eyesight with only a simple attachment to a basic Android phone. 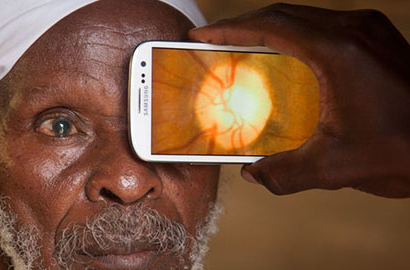 With 90% of all blind people in the world living in low income countries, this app, currently being tested in Kenya, could help save the sight of the millions who do not have access to ophthalmologists. Another example is mWater, which allows individuals to test for water contamination using only the camera on their smartphone and without the need of complicated lab equipment. During the first year of beta release, over a thousand users downloaded the app and mapped several thousand water sources. This month it was estimated that users of mobile money would reach 400 million by 2018. Perhaps the most important application of mobile technology in Africa, mobile money facilitates the transfer of money without the need for formal bank accounts, increasing the volume of remittances making it back to poor rural areas, eliminating the dangerous need for taxi drivers and vendors to carry cash and making saving easier for the financially illiterate and excluded. Prominent economist Jeffrey Sachs has written a great piece on the role of mobile money in promoting development in the Guardian this week. 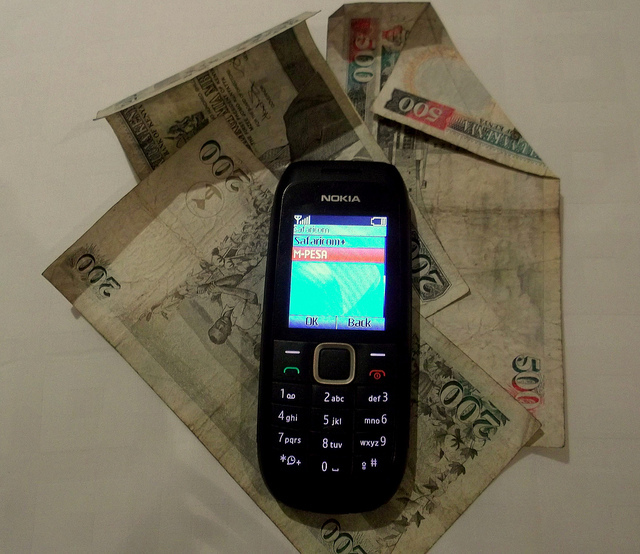 This month has seen exciting developments in the reach of mobile money. After a recent launch, Vodacom’s mobile money platform, M-Pesa, has reached 13% of the population of Lesotho and is approaching critical mass. As the fifth country in which M-Pesa has launched, the Lesotho franchise seems to have avoided the problems of low uptake and technical failures seen when the platform, which was wildly successful in its country of launch Kenya, was duplicated in other countries. In Zimbabwe, mobile phone penetration has reached 97% and it’s hoped that mobile money can be extended to improve the lives of the country’s largely rural, impoverished population. Functionality is becoming more and more sophisticated. In Rwanda, it is now possible to book and pay for bus tickets simply by texting the telephone provider. In Kenya, after the Westgate Mall terrorist attack, thousands of Kenyans have donated millions of shillings to the victims of the atrocity by sending an SMS to a Safaricom M-Pesa scheme. Mobile money has revolutionised economies and societies in Africa, constantly reacting to changing needs and issues. ICT has proven of vital importance in addressing everyday problems in Africa. The same technology is also, as just touched upon, of growing importance in dealing with exceptional circumstances. A recent piece from the Institute for Security Studies outlines the role of mobile technology in improving the life of ex-combatants in former conflict zones. In countries like Liberia and Rwanda, social media can be used to reintegrate ex-combatants into the community and allow information exchange between ex-combatants and government agencies. While its potential is hindered by poor infrastructure in many such countries and high illiteracy amongst ex-combatants, mobile technology has, again, proven valuable in unlikely situations. The Guardian published an interesting piece this month on the role of mobile technology in promoting transparency and good governance in Africa, looking specifically at ‘factivists’ using ICT in Ghana. Transparency projects, like the ones featured, are a major area of concern for Indigo; one to watch in coming months!